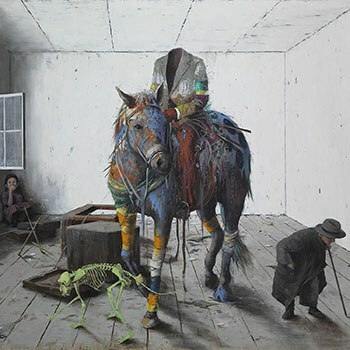 UNKLE's James Lavelle alternates slow, contemplative material with faster, darker pieces to excellent, fulfilling effect. James Lavelle has always had a gift for patience on his UNKLE projects. While he knows his way around a solid beat and a pleasing collaboration, he picks his moments, he offers a palpable sense of build and payoff throughout his albums, and he saves his most affecting moments for when they will be most effective. Never has this tendency of his been highlighted as forcefully as it is on The Road, Part 1, however. The latest UNKLE effort is cinematic almost to a fault, with a predilection toward thick string parts and dramatic shifts in mood. The album is primarily grounded in slow, steady piano balladry, something like an exploration of the themes of the classic "Rabbit in Your Headlights" without the fireworks that closed that classic. Nearly half the album is devoted to this style, a patience of approach that heightens the tension of the album enough to allow its faster material to serve as a euphoric release. Even better, these slow pieces stand on their own as beautiful pieces in their own right, slowly-developing soothers that could last twice as long and still not outstay their welcomes. The Road, Part 1 is bookended (save for a quick intro) by these sorts of piano-driven pieces. "Farewell" begins the album quietly enough, its quarter-note chords breathing with tension and release, its co-lead vocal from Ysée and Keaton Henson (note: a number of collaborators are listed on this song -- I believe these are the two primary vocalists, but I could be wrong) a beautiful duet worth getting wrapped up in for as long as possible. The album closes with "Sick Lullaby", a song that is as disorienting as its title implies, but just as quiet as "Farewell". These are beautiful pieces of music, the first hopeful in its aims, the last stalwart in its resolve. Elsewhere, "Stole Enough" is a lovely bit of transitional lullaby, while the positively radiant "Sunrise (Always Comes Around)". It is maybe the prettiest thing Lavelle has ever put to tape, a song that starts with quieter contemplative pianos and thick strings but eventually adds a fast-paced beat and a perfect vocal from Liela Moss. It's like one of Moby's more transcendent moments, a memory of the late '90s when electronic music felt like a vast, unexplored frontier of infinite possibility. Despite all of this contemplation and hope, Lavelle isn't afraid to go dark and dingy for the remainder of The Road, Part 1. Single "Looking for the Rain" is perhaps the most complete track on the album, with layers upon layers of instruments to discover. Mark Lanegan does his best Nick-Cave-meets-Tom-Waits over the top of it, but it's really the distorted guitar that drives home the mood here. Those guitars, not too loud in the mix but definitely present, push the stomp of a beat that Lavelle put together forward into the desert, a serenade for the quiet moments of the post-apocalypse. Elsewhere, Elliott Power offers vocal lines that Tricky might have done ten years ago, adding urgent, raspy spoken word to "Cowboys or Indians" and "Arms Length". Title track "The Road" starts quietly, but eventually turns into blissful big beat, reminiscent of Chemical Brothers' finest moments; think "Setting Sun" or "Let Forever Be". These are tracks that are fine on their own, but in the context of all the quiet that Lavelle has insisted on, they sound tremendous. Perhaps Lavelle's only misstep is his construction of The Road, Part 1 as a concept album. Five of the 15 tracks here are interstitials, little bits of atmosphere and spoken word that theoretically progress the album's story -- loosely based on the Oprah-endorsed Cormac McCarthy novel of the same name -- but mostly come off as pretentious and unnecessary. It's understandable. After seven years without an album, Lavelle wanted to return with a statement. What he perhaps failed to realize was that he already had one in the songs by themselves. These are carefully-constructed, engaging, moving pieces that exist on a plane beyond that of typical electronic-producer-with-guests material. Many of Lavelle's collaborators are artists who have worked with him before on other projects, and it shows. There's a familiarity here that allows Lavelle to get the most out of his vocalists and that allow those vocalists to find Lavelle's intentions with these tracks and slip into those intentions with an apparent effortlessness. Lavelle, as UNKLE, is at the top of his game; The Road, Part 1 is an excellent display of his talent.